The value of internationally traded goods and services in 2012 was equivalent to 19.1 per cent of GDP, which amounted to €164 billion for the year. Compared to 2000, this represents an increase in the size of internationally traded goods of 5.3 per cent. The government’s highest priority is restoring banking-sector health. Ireland’s modern, highly industrialized economy performed extraordinarily well throughout the 1990s, encouraged by free-market policies that attracted investment capital. 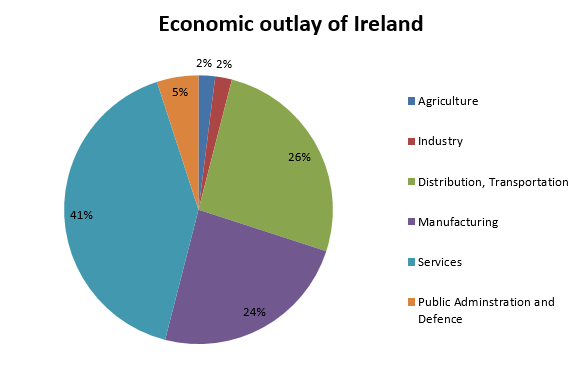 Services are the largest component of Irish output, in 2012 they accounted for 67 per cent of gross value added at factor cost, while industry and agriculture represented 31 per cent and 2 per cent of gross value added, respectively. Pharmaceutical products, computer and electronic products, and food accounted for 34.5 per cent, 17.2 per cent and 16.5 per cent of total gross industrial output in 2009. As the above chart helps us in analysing the distribution of GDP consumption per sector in the economy, students can examine which sector is the most flourishing and this can also help them decide which sector of the economy would they like to get involved in, when considering jobs in the future.